I absolutely loved our place when we first saw it, but having our stuff in it makes me love it even more. It just feels so cozy and a real reflection of both mine and Brad's personalities. Since we’ve lived here for over six months (which is absolutely insane to think about), we've gotten almost all the furniture we need to make the space more than live-able. I'm sure we will continue to acquire smaller home items over the course of us living here, and I will continue to update you on those sorts of things, however I think the layout we have now will be the same for the foreseeable future, so I figured now would be the best time to finally share our place with you all! By far my favorite room in the apartment is the living room. We have super big windows that look out to a bunch of trees, which is super nice considering we live in a major city and coming across views like that are few and far between. The room itself is so cozy and really feels like the center of the place (easy enough when you're dealing with a 700 square foot place). Because we got so lucky with the living room being so spacious, it doubles as my and Brad's office. We ended up getting a Floyd Table for our desk, because it was big enough to fit both of us comfortably, and when we move (although I don't think that will be for awhile), we can always repurpose the table as a dining table. One of my favorite parts of the living room is our bookcase. I had a ton of books left over from all of my classes in college and because I had spent so much money on them I wanted to make sure to keep as many as possible (granted I found them interesting at the time). It’s definitely not the most instagrammable bookcase, mainly because it’s not organized in rainbow order, but I wanted it to look real and like it actually gets used, rather than it just being a fixture in the room. I will say though, I organized it in alphabetical order when we first moved in and it took me forever, but it does make finding a book so much easier than having the spines be in a certain color order. 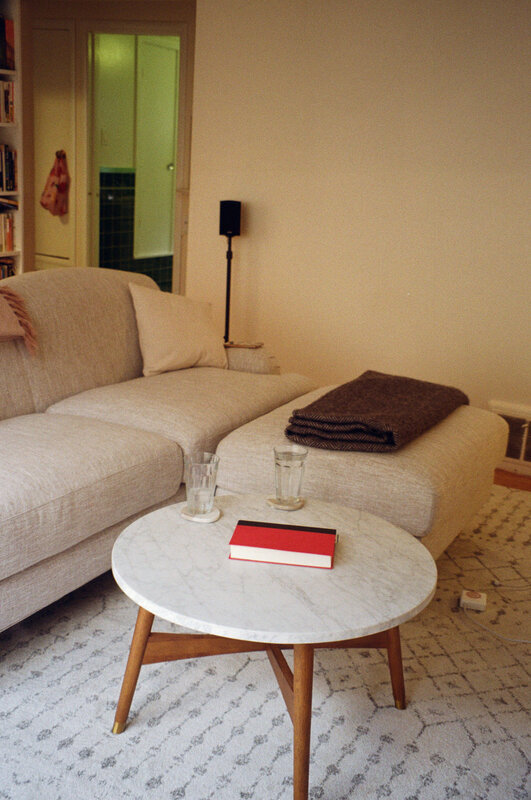 The couch was probably our biggest investment piece and one that we ummed and ahh’d over for a while. Luckily when we moved in we had a couch to use, however it wasn’t totally our style and it looked too heavy for the space. A lot of our furniture is very mid-century modern and it did make sense to continue that trend with the couch, but I didn’t want our place to look too matchy matchy or like it came out of a furniture store catalogue. I also love the look of mixing styles of furniture! I’ve always loved the look of traditional English roll arm sofas and they are simple enough that they can work easily with other styles of furniture, especially more modern furniture. I found the perfect one at Interior Define, and we are so so happy with it! Its a very formal looking couch because it’s very overstuffed couch, but it has already started to soften up quite a bit and adding throw pillows and blankets helps it to look more casual. 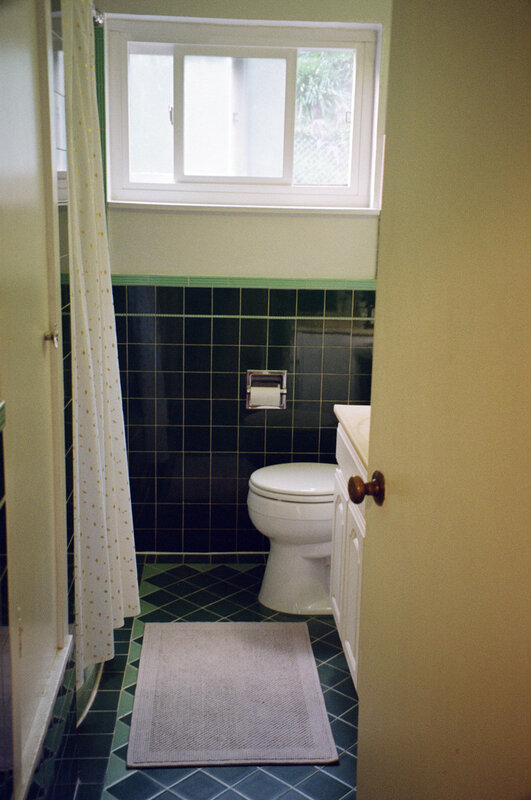 The kitchen and the bathrooms were definitely the easiest rooms to put together just because they are such small rooms and they don't really require much in the way of decorating. 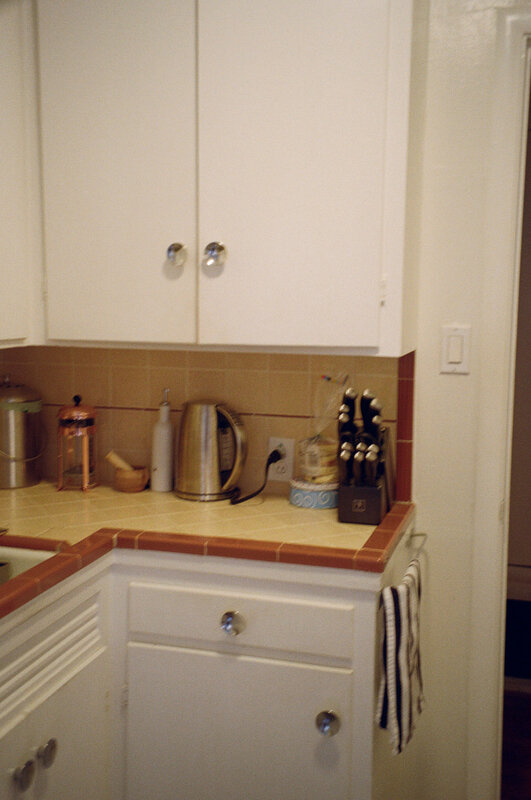 Luckily our kitchen has just enough room to house our IKEA little table that we had at Brad's old apartment. Because we don't have much counter space, the table also doubles as extra work space. The chairs are from Poly and Bark, and were a complete steal, I think we got a set of four for $120! 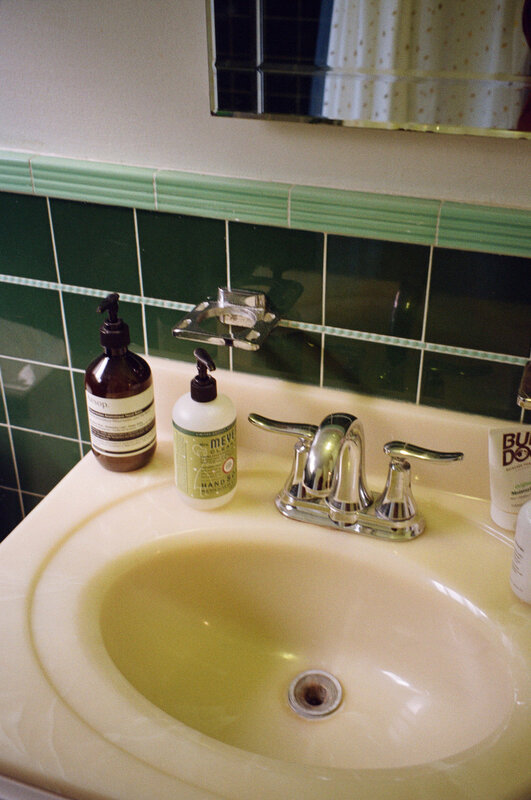 I am absolutely obsessed with our bathroom; it's so outdated, but there's a certain charm about it. Luckily, even though its outdated, it's been well-kept over the years so it doesn't look too worn out. Last but not least is the bedroom. Our bedroom isn't all that big, so we don't spend a lot of time in here besides sleeping, however I still wanted the space to be comfortable and relaxing. Brad had bought the bed last year from West Elm and it definitely is the focal point of the room, mainly because it takes up most of the room. We got our bedside tables and dresser from Living Spaces (and they are almost an exact dupe for a set from West Elm, but came to about 60% less than we would have spent on the West Elm version). One thing that I would 100% recommend if you are either moving or are redecorating is investing in good linen bedding. There’s just something about linen that always looks good, even when it is wrinkled. It also just keeps getting better and better the more you wash and use it. Because we live in such a temperate climate, we don’t need super warm sheets, so the linen also works as year-round bedding for us. As part and parcel of moving back to San Francisco, I moved back in with my parents into my childhood bedroom. 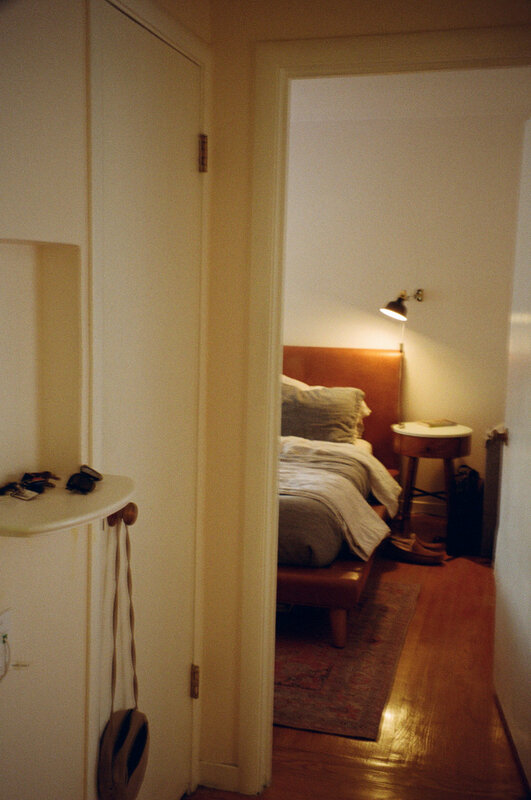 I absolutely love that room. When my parents did a massive renovation on the house about eight years ago, my sister and I got to move into separate rooms and our parents let us pick out most of the details of the design of the room from the bed frame, to the wall color, to the lighting fixture. Because of all of that this room has always felt like mine, rather than a room that my parents designed for me. While I love the major aspects of the room, it felt weird to be 22 and be living in a room that had been reflective of my teenage self. In other words, it was due a refresh. I started the whole refresh with my bed, I had my old bed frame since I moved into this room and while it was a nice one, I wanted something a bit more minimalist and modern. I luckily already had an IKEA Malm bed frame from my apartment in college and just decided to swap out my old one for this one. I also replaced the bedding with this duvet cover set from Urban Outfitters, again to go along with the more modern aesthetic. After moving back from college I had my full book collection so I rearranged my bookshelf above my bed to be color coordinated because its just so darn pleasing to look at. My bedside table was due a rejig so I bought a new frame and put some of my favorite polaroids in it. I also bought this dreamy Boy Smells candle, which not only looks great but smells incredible, it's making me very much look forward to autumn. I also invested in an Echo Dot, which has replaced my rather outdated and clunky iPod speaker/alarm clock. It wouldn't be a bedroom post if it didn't include my cat bailey. I've had this Papasan chair for five years or so and I replaced the throws I have hanging over it just to make that space look a bit more pulled together, but still cozy. Clearly Bailey thinks its a cozy spot. One of my favorite corners of my room is where I have my guitar and amp. Not only do I think they add a lot to the room in terms of looks, but I like having them be front and center so I remember to actually pick up my guitar and play it on a regular basis. I also bought this 2018 calendar of 60s rock posters from the Summer of Love exhibit at the deYoung Museum. The final and biggest part of this bedroom refresh was replacing my desk. I previously had a huge desk with a giant hutch that took up a huge portion of the wall. While it was a functional desk, it got cluttered really easily and I no longer needed a desk quite as big. 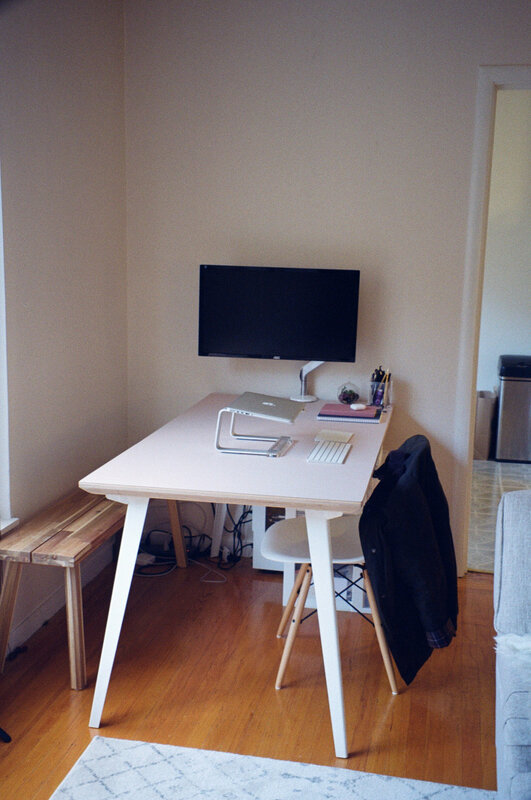 I opted for the IKEA MICKE desk, which is super simple but actually can store a lot. I love how much getting a new desk has changed the whole feeling of my room. It also opens up the opportunity to start putting together a gallery wall, which I will definitely write a blog post on once it is finished! Ever since moving away to college almost four years ago I have lived in different apartments. Freshman year I lived in on-campus apartments for first-years, sophomore year I lived in a townhouse off-campus with three other girls, and then junior year I moved into a studio apartment that I am still living in now. Being someone who's mood is very much affected by their surroundings (as discussed in last weeks post), I struggled a bit when I first moved away from home because I found it very difficult to create a space that felt like my own when I wasn't going to live there for very long. 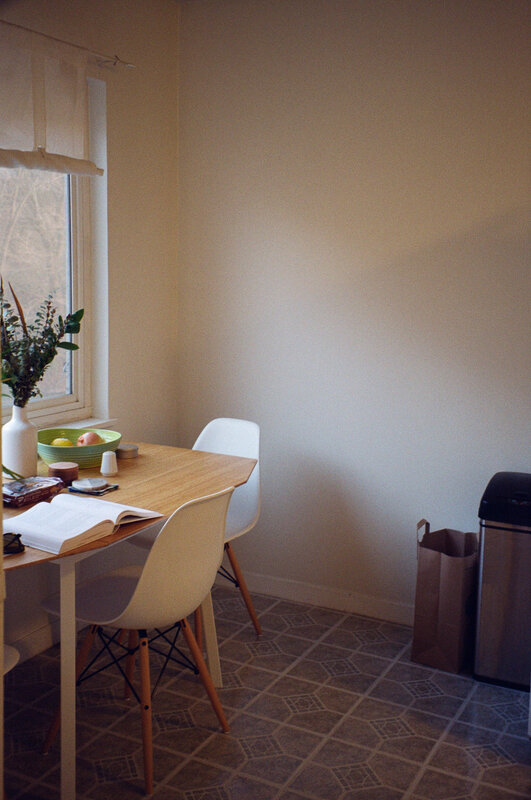 Making an apartment, especially a college apartment, feel homey and like its your own is difficult because 1. chances are you won't be there for a very long period of time and investing in the place can feel like a waste and 2. because it is a rental it can be nearly impossible to make more permanent changes to suit your particular style. However, I've found that making an apartment feel more like a home is possible (even if you're on a budget like me), it just takes a bit of time and experimenting with less traditional decor options. Focus on Bedding ~ I've found that if you're going to spend money on decorating and filling your apartment the best place to do it is on bedding. Considering the fact that you spend about a third of your time in bed, it should be a place where you feel the most comfortable and the most cozy. Especially since I live in a studio apartment, my bed is the biggest piece of furniture in my living space and I am constantly looking at it so I like it to look nice and cozy. I also like to throw blankets over my couch because its not a piece of furniture that I particularly love (my apartment was partially furnished when I moved in) and it does make the piece a lot more cozy and is more personalized to my taste. You don't have to spend a ton of money on bedding but I think a subtly printed duvet cover and nice sheets can make a world of a difference in the overall look of a small apartment. 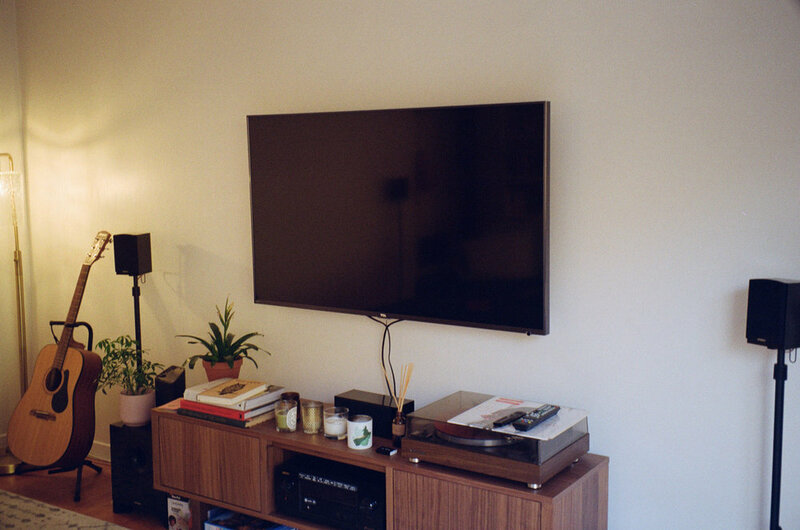 Add Greenery ~ I talked about this in my last blog post, but I'm going to bring it up yet again, I think one of the nicest ways to spruce up an apartment is by adding greenery, whether it be in the form of houseplants or flowers. This is a relatively cheap way of adding some more color into a small living space, and for me at least, having greenery in my apartment instantly makes me feel better. As clichéd as it is I think succulents are always a good place to start because they look adorable and are relatively easy to take care of, and thats saying something for me because I have the least green thumb there is. Decorate with Everyday Objects ~ Because my apartment is such a temporary living space I have not felt the need to buy decor for the sake of buying decor. Rather than buying loads of throw pillows and artwork for my walls, I like to decorate my apartment with more everyday objects. One of my favorite parts of my apartment is my little bookshelf, which I have organized all of my books by color. Not only does this part of my apartment serve a practical purpose, but because all of the books are color coordinated it acts as a kind of decor because it is so visually pleasing. I also like to scatter things like my cameras onto surfaces in my apartment because they are representative of my hobbies and I love how the look. In terms of filling up space on the wall, posters and prints are pretty much my go-to for "artwork". I have a glossier poster hanging up, which came with one of my orders (all glossier orders come with a different poster by the way) as well as a print that I randomly bought at Urban Outfitters a few years ago and a poster from a band that my friend got me for a birthday present. 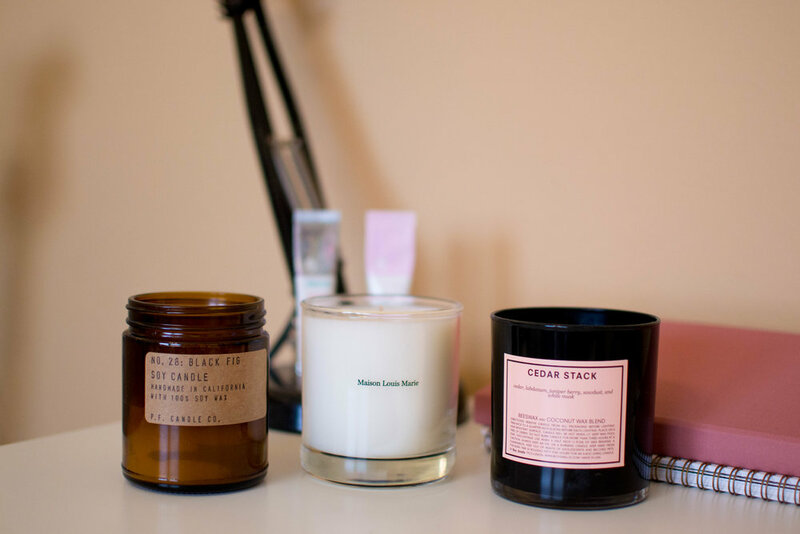 I think decorating with more everyday objects is not only a cost-effective way to decorate an apartment, but because they are such personal objects they really show your own hobbies and interests. Lighting Is Everything ~ When I moved into the apartment that I live in now, the thing I hated about the space was the lighting. There is one overhead fan light in my apartment and not only is the fixture itself pretty awful-looking and outdated, but the light itself is just not pleasing at all and makes the whole apartment look a bit drab. One way I remedied this was getting a floor lamp from Ikea to add a bit of brightness, but also to act as a furniture-like fixture for the apartment. I also added fairy lights around my bed to create a kind of faux-headboard and the light that these string lights adds makes a load of a difference in terms of the way my apartment looks and feels. 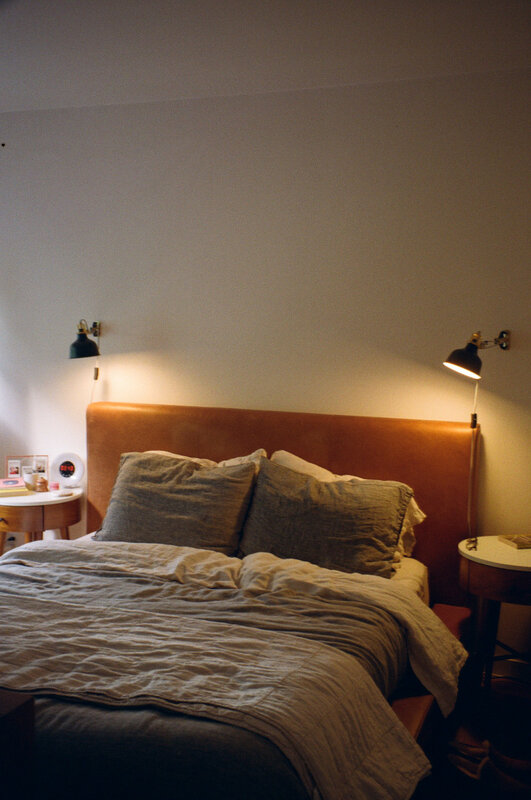 Lighting is a really cheap way to spruce up and make an apartment seem a lot more cozy and inviting.